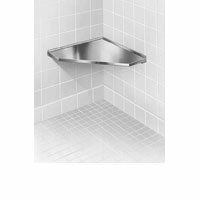 [XPB-954-X] Corner Shower is fabricated of 16 gauge stainless steel with exposed surfaces and architectural satin finish. Seat is attached to wall with full length stainless steel piano hinge for vertical storage when not in use. Stainless steel clip secures seat and vertical position. Specifications and detailed information available upon request.